Washington Fox Terrier Rescue View other Fox Terriers for adoption. 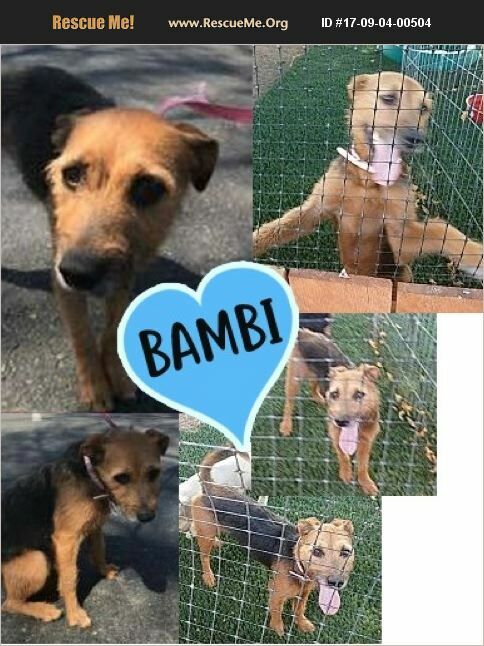 Bambi is 2 year old fox terrier mix who ended up in a high kill shelter in California. This poor girl was returned to the shelter twice. Her previous owners said that she had separation anxiety issues and for some reason, claimed that she didn't get along with the other dog in their home. After we got her out of the shelter, we noticed that she had some issues fixating on certain items. We felt it best to send her to our wonderful trainer in California, Upon her return we learned that she, in fact, LOVES being around people other dogs but she does not get along well with cats. Bambi is a bit skittish with men. She does not like someone to approach her fast with their arms out she would prefer someone approached her slowly. Once she feels comfortable with you she can be your best friend! Bambi does great on a leash but has a tendency to cower at loud noises or big trucks when she is not secure with the person walking her, but if you just continue walking through it, she will follow. She loves food and is very treat motivated. Bambi is up to date on her vaccinations, spayed, microchipped, and heart worm negative. Bambi has an adoption fee of $500 and is looking for that very special home. __________________________ **IMPORTANT DETAILS - PLEASE READ** An application must be filled out before consideration for adoption. Please do not apply for a dog until you are ready to commit a lifetime to him/her. We are an all-volunteer 501c3 non-profit group of animal lovers. Our adoption fee is non-negotiable as we need these funds to pay our current medical bills for our dogs as well as any future dogs we rescue as well. As an adopter, you must be prepared to accept the fact that these dogs are rescues and, just like you and I, they all have their own individual personalities. In most cases, these little ones have been through a difficult journey that started when their family gave them up or they became lost. They may have been under stress, neglected or even abused in their past life or frightened by being left alone on the streets to fend for themselves. Our number one focus is finding these little loves a wonderful forever home with a family who is going to care for them and show them what it is like to be loved in a safe environment with a full belly and a warm bed. These sweet babies do not ask for much from you but they may require a little patience and understanding. WE ARE NOT A SHELTER, WE ARE AN ALL VOLUNTEER RESCUE WITH FULL-TIME JOBS. Please do not contact us to come look at a dog. We will contact you once we have received and reviewed your completed application. A home visit as well as a reference check MUST be completed before a meet & greet can be scheduled. Thank you for your patience and cooperation.